Good fertile soil is one of the foundations of any landscaping project. We ensure that our composts and soil improvers are produced to the highest environmental organic standards and are peat-free. Compost and soil improvers restore the structure and nutrient levels vital to plant establishment, stronger root development and healthier plant growth. A mix of coarse and fine particles is needed to create a balanced compost that contains enough water and air so essential for root growth. Soils and Stone offer a range of composts, including a standard multipurpose compost, PAS 100 natural green waste compost and ericaceous compost. Our composts can be delivered in the loose via grabs or tipper, or via industry standard bulk bags. Really big loads can be delivered via hydraulic walking floor delivery. Need compost in a hurry? We offer a next-day delivery service on bagged compost for most areas within the UK. 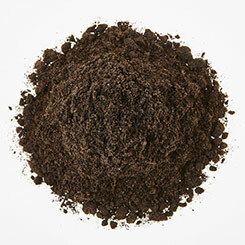 Ericaceous compost is produced for acid-loving, lime-hating plants such as rhododendrons. With a pH value of 6.0 to 6.5, it provides the correct balance of nutrients to promote healthy root growth.